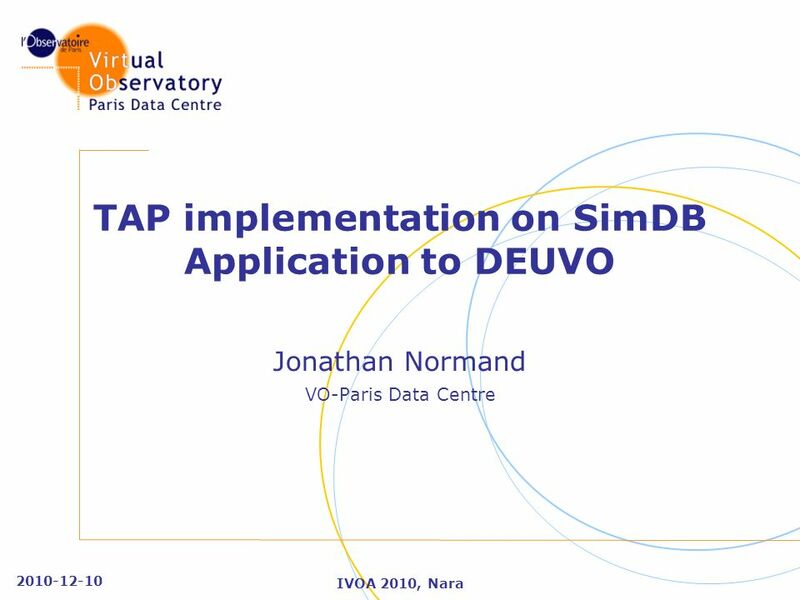 2010-12-10 IVOA 2010, Nara TAP implementation on SimDB Application to DEUVO Jonathan Normand VO-Paris Data Centre. 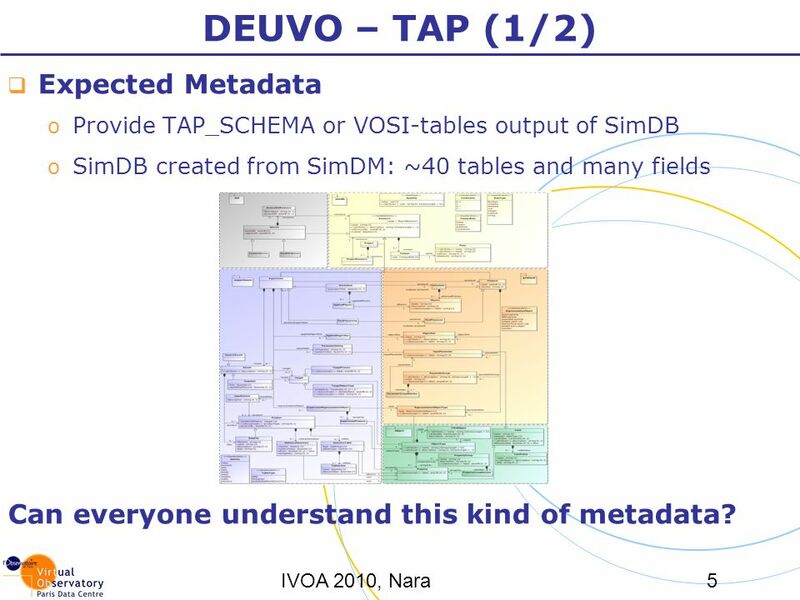 5 IVOA 2010, Nara5 DEUVO – TAP (1/2) Expected Metadata o Provide TAP_SCHEMA or VOSI-tables output of SimDB o SimDB created from SimDM: ~40 tables and many fields Can everyone understand this kind of metadata? 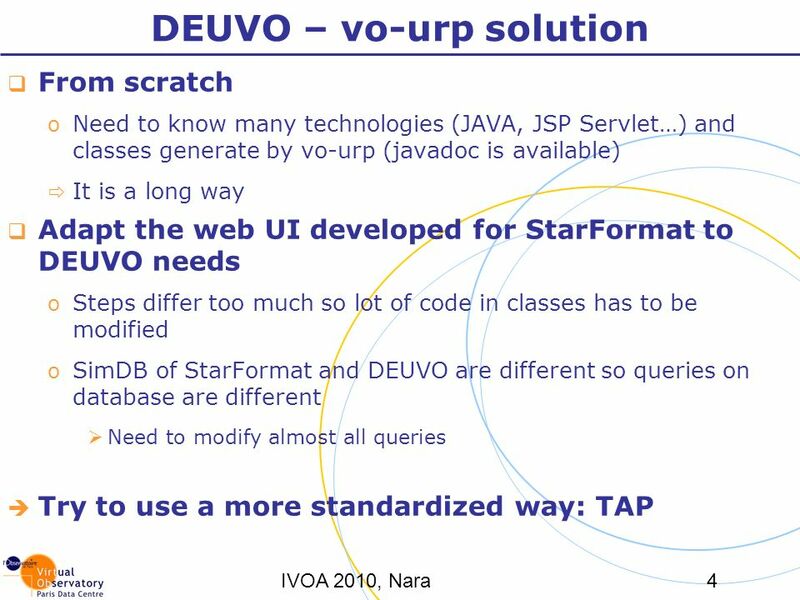 Download ppt "2010-12-10 IVOA 2010, Nara TAP implementation on SimDB Application to DEUVO Jonathan Normand VO-Paris Data Centre." S0 S1 S2 S J Trellis Diagram. USERS COMPUTERS USER LAYER RESOURCE LAYER USING SHARING VO CORE PROVIDERS IVOA Architecture VOSpec. 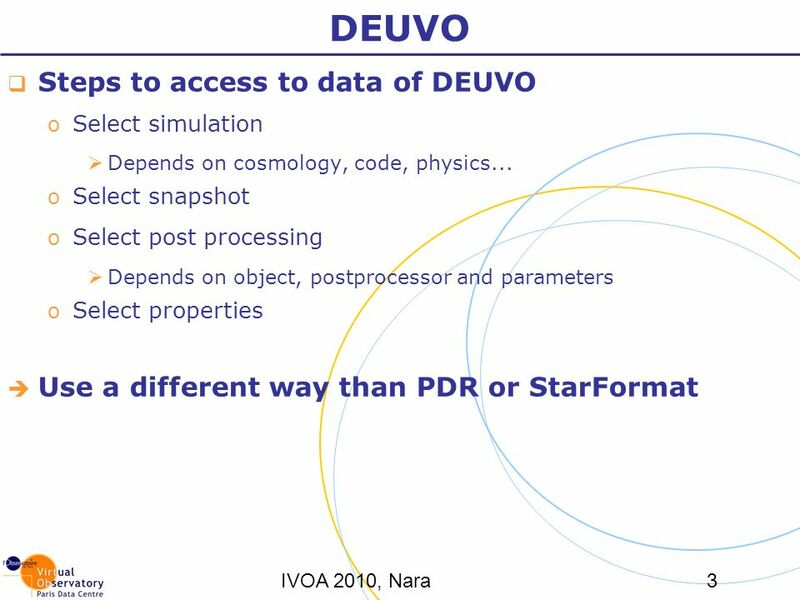 Building a Mock Universe Cosmological nbody dark matter simulations + Galaxy surveys (SDSS, UKIDSS, 2dF) Access to mock catalogues through VO Provide analysis. SimDB as a TAP service various TIG members (IVOA.IVOATheorySimDB)IVOA.IVOATheorySimDB. 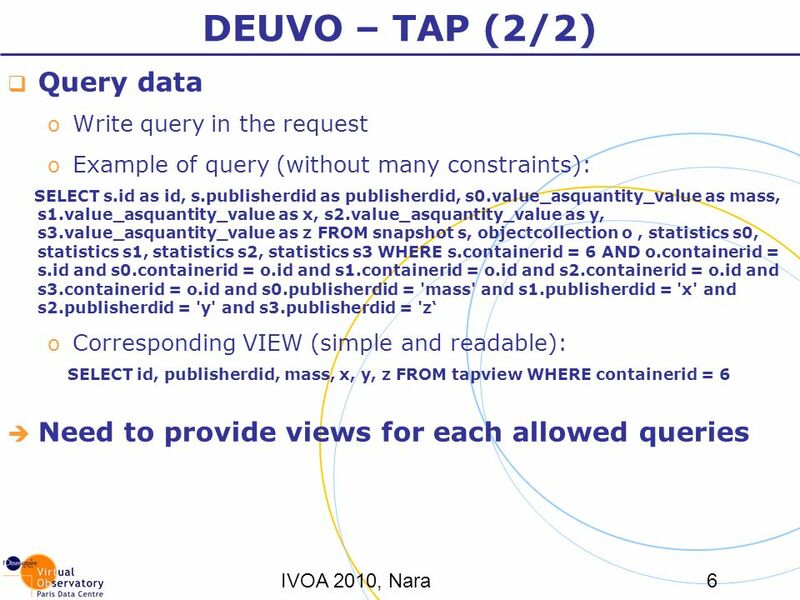 A.Micol IVOA Registry REGISTRY WG Mar 2003 A Science Case (and 1000 Questions) for the IVOA Registry. Theory Interest Group Victoria INTEROP May 2010. 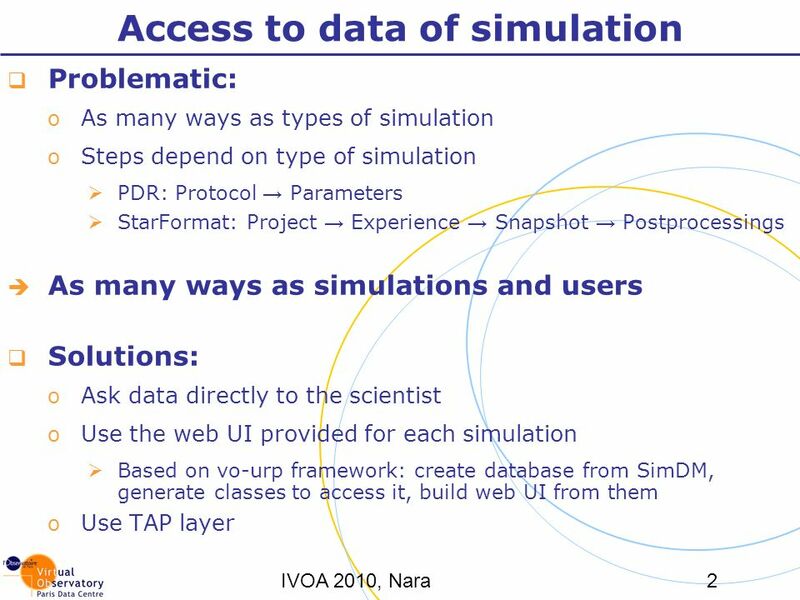 DM: Simulation Data Model RFC and other comments Tuesday, , A.
Ruby on Rails Model of MVC. Model-View-Controller Paradigm A way of organizing a software system Benefits: Isolation of business logic from the user interface. Theory Interest Group H. Wozniak May-19H. Wozniak / Obs. Strasbourg / VO-France2. Using JavaServer Pages Harry R. Erwin, PhD CIT304/CSE301. Design Aspects. User Type the URL address on the cell phone or web browser Not required to login. Part 1: Overview of Web Systems Part 2: Peer-to-Peer Systems Internet Computing Workshop Tom Chothia. Design and Planning Presenter: Mike Team Members: Casey Kaushik Danny. SDJ INFOSOFT PVT. LTD. 2 BROWSERBROWSER JSP JavaBean DB 1 4 3 Req Res Application Layer Enterprise server/Data Sources.